North Bloodborne Pathogen Kits are high quality kits that are made for RESCUE WORKERS in order for them to provide personal protection while responding to emergency situations. They are widely used in correction departments, municipalities, transportation companies, doctor's offices, and all types of industries across America. These Kits come in different sizes. 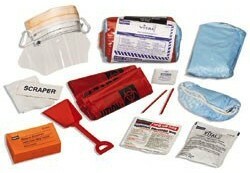 We also offer refills for these kits as a more economical alternative to repeat purchasers.